The Gondola is more than a renowned type of boat of the Venetian lagoon, is actually a piece of history still resisting to the waters of the lagoon; it is a work of art that still nowadays agile and slender floods the canals, between ancient palaces and bridges. But what are its origins, its roots and when its history begun? 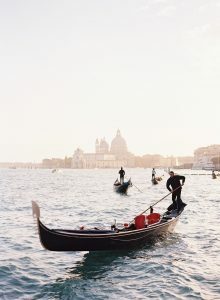 The name Gondola – The etymology of the name is quite uncertain, it maybe comes from an intersection of the verb dondolare (to swing) and the greek verb kondura, indicating a boat with a short tail. The construction of the Gondola – The gondola is made with 280 different places of wood and its effective construction lasts more than one year. The Gondola has a length of 11 meters and with its asymmetrical shape (the left side is usually wider than the right side) is directed by a long paddle. This paddle is then supported on a specific wooden structure called forcola. 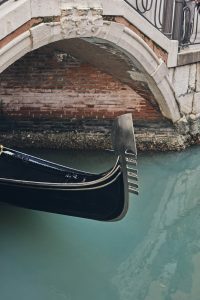 Despite its quite impressive length, the gondola is extremely easy to be conducted thanks to its flat bottom..this is a Venetian tip, to avoid any crash between gondoliers you can easily hear the typical “Ohe” informing of the imminent turn into a narrow canal! 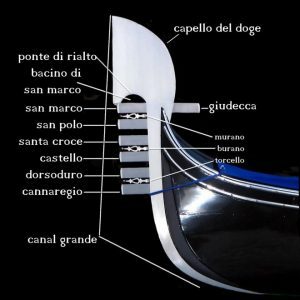 The Fero de prova – The typical ironed “comb” that characterises the prow of the gondola has a beautiful meaning every Venetian know by heart. Its shape represents the most important parts of the city: the six “teeth of the comb” are the six sestrieri (districts) of Venice (San Marco, San Polo, Santa Croce, Castello, Cannaregio and Dorsoduro), the “internal teeth” is the island of Giudecca, the round shaped sum is the famous Doge’s Hat, the little arch on top of the highest “teeth” is the Ponte di Rialto (Rialto bridge) and the three thinner decorations among the “teeth” are the three islands of Murano, Burano and Torcello. Some curiosities – In the past the gondole were covered with a removable black top and they were at exclusive use of the transportation of the noble families; each family had its private gondolier always at disposal for its transfers. The famous freschi were chances for meetings and worldliness, literally promenades on the waters, cuddled by the sweet role of the gondola.This habit gave origin to a specific type of music, the so called canzone da batelo (song for the boat), facing its apogee in the XVII century but still in vogue today among the tourists. Created as a practical form of transport, they transformed over time into objects of sleek beauty!